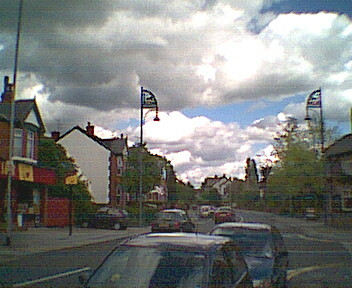 Taken on a dramatically cloudy day, this picture shows both new lamps of the start of the new lamp zone, looking along Compstall Road from the east. As indicated above, the two lamps at the Stock Dove/Thresher's have been placed opposite each other to define a boundary rather than staggered, like the others. 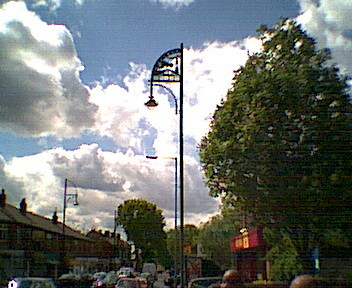 A view of the right-hand lamp in the picture above [the one at the Thresher's wine store]. This one has just been painted with the dark grey undercoat. 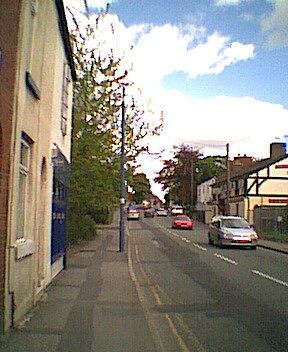 One of the old lamps can be seen behind the new one on the same side of the road. This old lamp carries a Homewatch sign and it seems to have been reprieved until the council can come up with somewhere else to put the sign. A 'regular' new lamp with an unadorned top [painted black] can be seen on the left side of the road. 10 The replacement job is definitely being controlled by cowboys. 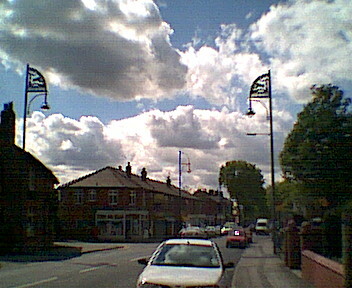 On the left is the first of the new lamp posts at the western end of the new lamp zone. It is just up the road from the battered Welcome sign and on the same side, and before the Friendship Inn (visible on the right side of the road). It is still awaiting a topping out ceremony at the end of the first week in May. 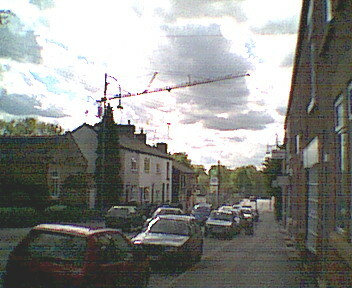 The zone ends at the building site where Davies & Metcalfe used to be  where the large crane is (right). The light-coloured Foundling Terrace (1861) provides a common point of reference for the two pictures (left by the red car; right middle of picture). 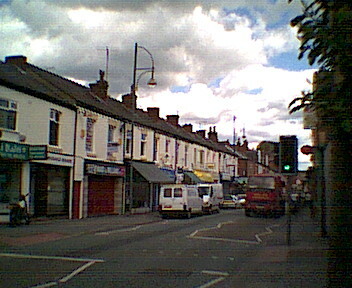 A view of the shops along Stockport Road at the Pelican crossing by the post office. The new lamps are all on the left (north) side of the road here. In the foreground is a black-painted new lamp which has an unpainted grey band, which is awaiting its stripe of gold paint. 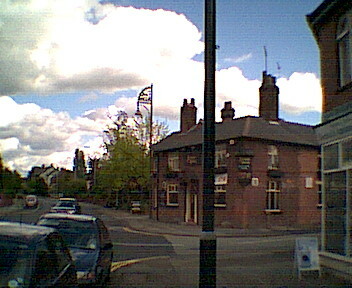 The view in picture 8 as seen from the west on Compstall Road, looking out of the new lamp zone. This picture of the eastern limit of the new lamp zone was taken on a fairly sunny day, but the sun kept disappearing behind these dramatically threatening clouds.